Not sure what to outsource and what to keep in house? 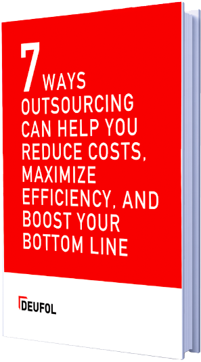 Download our guide, "7 Ways Outsourcing Can Help You Reduce Costs, Maximize Efficiency, and Boost Your Bottom Line." How to maximize your resource by focusing strictly on your core skills and value. How to streamline your supply chain so your parts and materials get where you need them when you need them. How to fulfill custom orders and low-volume jobs without disrupting your production schedule. How to maximize every square inch of your facility and still meet your fulfillment obligations. How to ensure quality on every part, product, and container you ship. How to maximize overseas production and supply chain opportunities without investing in a large overseas team. The industrial world is changing quickly. You and your team don't have to face those changes on your own. Find partners who can take tasks off your plate and help you elevate your business.